Intel Corporation designs, manufactures, and sells integrated circuits for computing and communications industries worldwide. This dividend challenger has increased distributions for the past 8 years in a row. 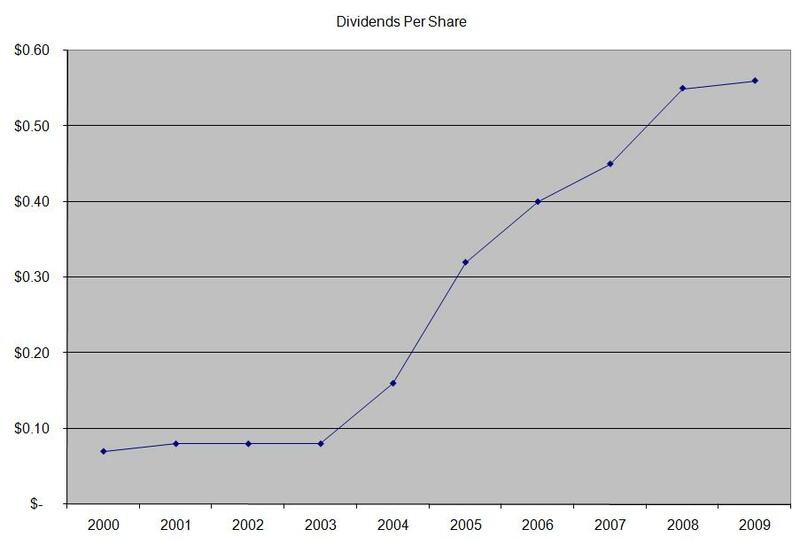 The latest dividend increase was in November 2010, when the company raised distributions by 15% to 18 cents/share. Over the past decade this dividend stock has delivered a negative annualized total return of 6.40% to its shareholders. The company has managed to deliver a negative 7.20% average annual increase in its EPS between 2000 and 2009. 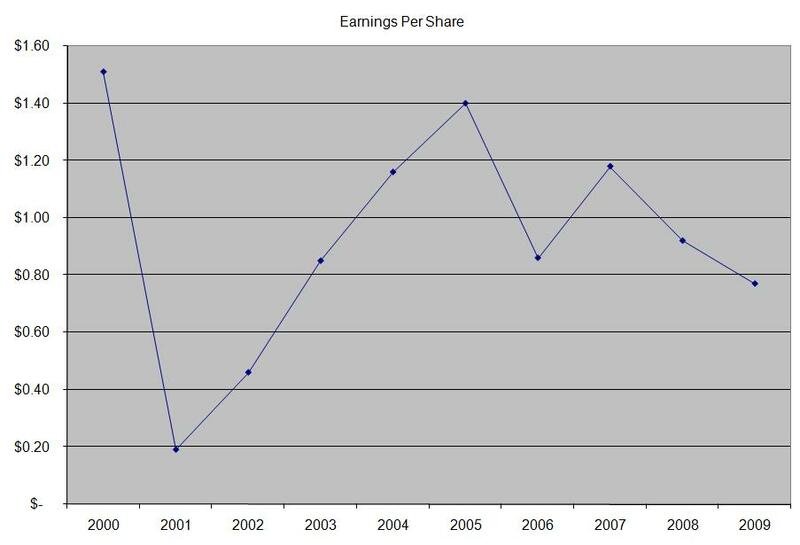 Analysts expect Intel to earn $1.99 per share in 2010 and $1.94/share in 2011. In comparison, the company earned $0.77/share in 2009. Intel is basically the main game in town when in comes to microchips. The PC replacement cycle in addition to IT spending driven by the new Microsoft (MSFT) Windows 7 system could boost sales in the near term. The company shipped 80% of all microprocessors in 2009. It’s main competitor is Advanced Micro Devices (AMD), whose market share is approximately 20%. Product differentiation is very difficult to achieve in the semiconductor industry, and there is some commoditization of the product line. As a result price wars could affect profitability in a negative fashion. In addition to that, the need to constantly invest money in R&D in order to keep competitive is a typical characteristic behind every tech stock, including Intel. Tech spending is highly cyclical, which leads to EPS volatility. This could provide a ceiling to consistent dividend increases, and could also increases the risks of a dividend cut. 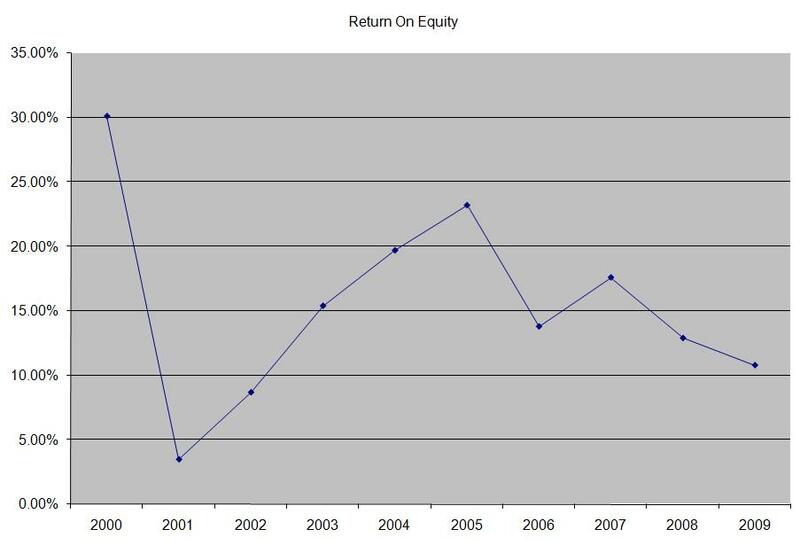 The company’s return on equity has been in a steady decline, after peaking in 2005. Rather than focus on absolute values for this indicator, I generally want to see at least a stable return on equity over time. The annual dividend has increased by an average of 26% annually since 2000, which is much higher than the growth in EPS. 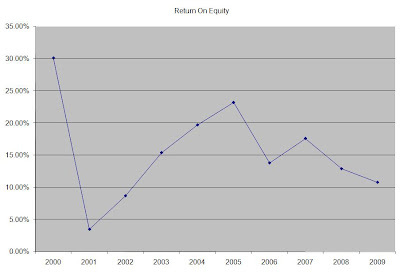 The main reason is the increase in the dividend payout ratio over the past decade. A 26 % growth in dividends translates into the dividend payment doubling every three years. If we look at historical data, going as far back as 1995, Intel has indeed managed to double its dividend payment every three years on average. 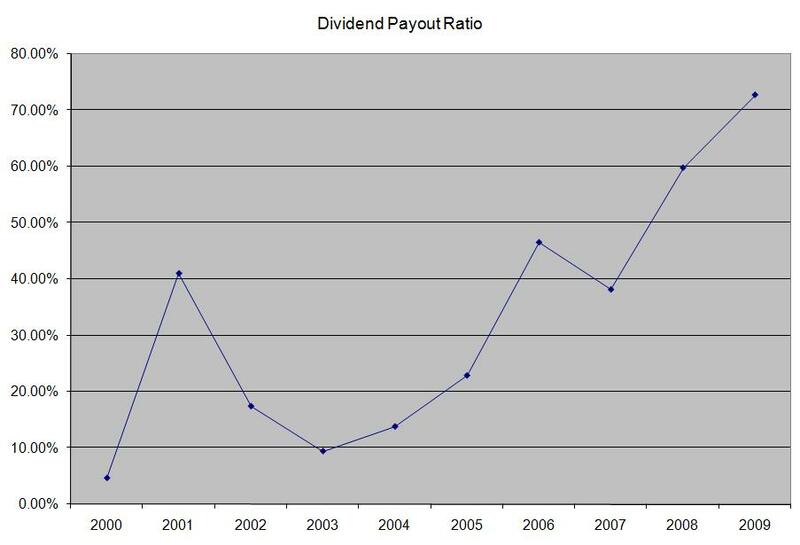 The dividend payout ratio has increased over the past decade, reaching 73% in 2009. 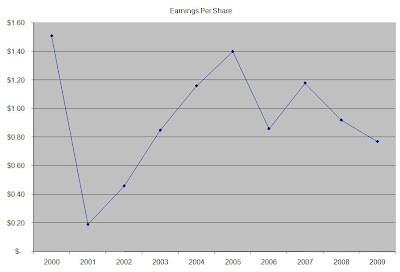 Based off 2010 forward earnings, the dividend payout would decrease to 37%. A lower payout is always a plus, since it leaves room for consistent dividend growth minimizing the impact of short-term fluctuations in earnings. Currently, Intel is attractively valued at 10.80 times 2010 earnings and yields 3.00%. The company is the leader in microprocessors and it is cheaper by historical standards. However given the erratic earnings trend and the fact that the company is two years away from being eligible for inclusion in the dividend achievers index, I would rate it as a hold for the time being.